Light weight and durable, Truck Magnum™ Mudflaps provide the ultimate protection for your boat, camper, and just about anything you can tow from road debris. Protect what you tow with a set today! Do you own a boat, a camper, or a trailer? If you answered yes to any of these, or if you haul something else behind your full size pickup truck or SUV, do you know what kind of damage the rocks, salt and other road debris are doing to what you are hauling? Every time you drive down any road, thousands of rocks and other road debris are getting kicked up from your tires and cause surface and corrosion damage to your investments costing you time and money to repair. By making a small and easy upgrade to a set of Magnum Mudflaps you can start protecting your investment. Magnum Mudflaps provide boat protection from road debris and are perfect for the avid fisherman or water recreation enthusiast. Not only can Magnum Mudflaps provide boat protection, but they can prolong the life and looks of whatever you are hauling.On top of that, the Truck Magnum Mudflaps can be easily attached and detached through a standard trailer hitch mount and are universal to most major makes and models of full size pickups and SUVs. Do you own an ATV or UTV? 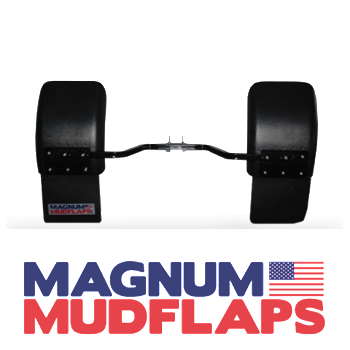 Magnum Mudflaps offers the only set of mud flaps custom made for ATVs and UTVs on the market. Mangum Mudflaps are perfect for the avid and average sportsman. Ice fishing, trail riding, duck hunting, deer hunting—you name it! 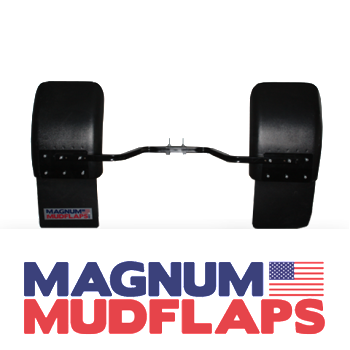 Magnum Mudflaps will help knock down the debris and keep your gear clean! Click here to learn more! Magnum Mudflaps line of heavy duty mud flaps for trucks, ATVs and UTVs, provide the ultimate protection for just about anything you can tow from the damage that the road can kick at it. 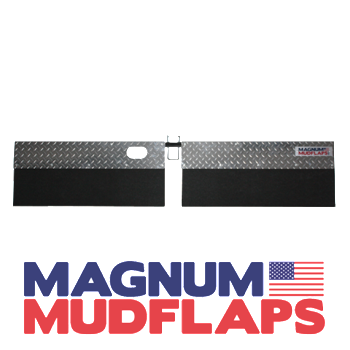 Every process in the manufacturing and assembling of the Magnum™ Mudflaps is based entirely in the USA and made with the recycled strongest, highest quality parts. Nothing is outsourced to any other country, and every part is produced with the true American spirit of being the highest value, longest lasting product on the market.